Enrico Ramirez-Ruiz, associate professor of astronomy and astrophysics at UC Santa Cruz, has been elected a corresponding member of the Mexican Academy of Sciences. There are currently 2,156 members of the Mexican Academy of Sciences and 82 corresponding members (including 10 Nobel laureates). Corresponding members are active researchers outside of Mexico who are recognized for their merit and for their contributions to the development of science in Mexico. 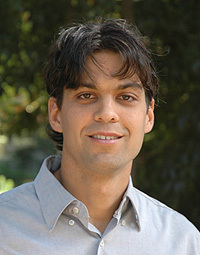 Ramirez-Ruiz, 35, is the youngest scientist ever elected to the academy. A native of Mexico City, he was named one of the 10 Best Mexican Young Scientists by a leading Mexican science magazine in 2006. Since joining the UCSC faculty in 2008, Ramirez-Ruiz has won a prestigious Packard Fellowship for Science and Engineering and a National Science Foundation CAREER Award. In 2009, he established the John Bahcall Award, which supports an outstanding undergraduate physics student from Mexico for an eight-week research internship at UC Santa Cruz.